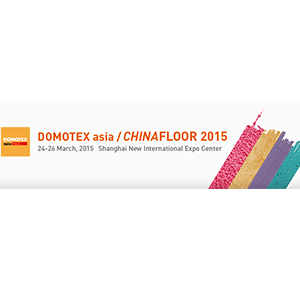 [Shanghai] It will require four dedicated halls to house the wood and laminate exhibitions at Domotex asia/Chinafloor’s 17th annual flooring show to be held here March 24-26, 2015, show organizers, VNU Exhibitions announced. According to show organizers, the current number of international brands booked for this specific product category has already reached the final 2014 brands’ registration number 5 months before the next show opening. The international wood flooring brands increased by 50 percent compared to the same period last year. For the whole wood and laminate flooring sector, including international and domestic exhibitors, Domotex asia/Chinafloor organizers have already received a record of booths’ booking which forecasts an increase of companies’ participation in this particular section. Among the international wood and laminate flooring exhibitors are Kronoswiss, Kronotex, Lamett, Beaulieu, Ter Hürne, Parla, Stile, Egger, Berry Alloc, Witex, Floover, Tilo, BKB and SE Timber Floors, while some of Asia’s more well-known domestic exhibitors include Nature, Sunyard, Yihua, Boer, Jinqiao, Teclic, and Huaming will showcase their latest flooring as well. Last year the full flooring show hosted nearly 1,200 exhibitors from across the industry with about 22 percent representing international companies from outside of China. In all, the 2015 show will encompass 12 halls covering 140,000 square meters of exhibit space.